Amanda Bangs created a stakeholder engagement strategy for McDonald’s climate change activities. The global restaurant chain, McDonald’s Corporation, is on a journey to advance the sustainability strategy for its restaurant operations and supply chain. EDF Climate Corps fellow Amanda Bangs was enlisted to develop tailored approaches to engage suppliers, franchise owner/operators, office employees and key internal functions to reduce McDonald’s direct and indirect carbon footprint through GHG management, recycling/waste programs and employee engagement. 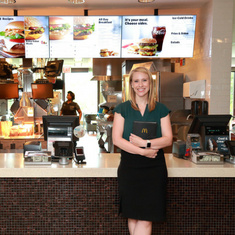 The carbon reduction strategy will support efforts in more than 36,000 restaurants and thousands of supplier locations worldwide, ultimately connecting to the experiences of the millions of customers McDonald’s serves each day across more than 100 countries. Amanda Bangs is a MBA candidate at NYU Stern. Amanda is one of the co-presidents of Stern's Social Enterprise Association. She also serves on the student committee for the Center for Sustainable Business. Prior to business school, Amanda worked for Deloitte Consulting in the Strategy & Operations practice.